Remove the map lamp. Refer to INL-52, "Removal and Installation". Remove the moonroof motor bolts (A). 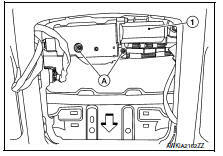 Disconnect the harness connector and remove the moonroof motor assembly (1). Do not run the removed moonroof motor assembly as a single unit. 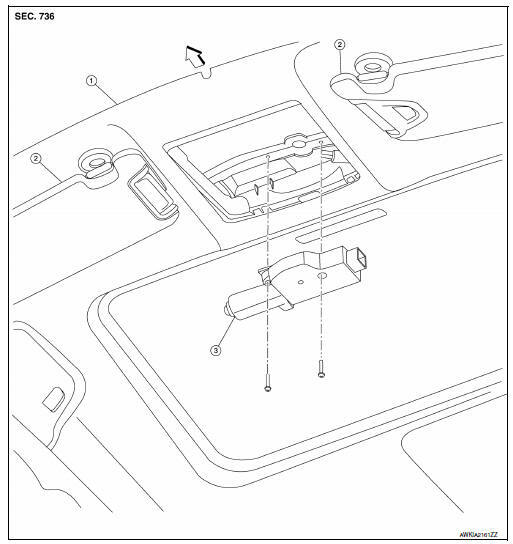 Move moonroof motor assembly laterally little by little so that the gear is completely engaged into the wire on the moonroof unit assembly, and the surfaces become parallel. Install the bolts and tighten. Before installing the motor, be sure to place the link and wire assembly in the symmetrical and fully closed position. Remainder of installation is in the reverse order of removal. Synchronize moonroof motor assembly with moonroof unit assembly.